Get your new go anywhere bag with this tote by Annabel Ingall. Show it off at work or out shopping with your girlfriends! Saddle brown large pebbled leather tote. Top opens to an unlined interior with two pockets. Strap drop is 9". 13" tall, 22" long, and 5.5" deep. Casual every day bag. Didn't have as much structure as the picture looked, but still loved it. I have a 11 month old and it was the perfect bag to look fashionable yet carry all my essentials! scratches easily, so handle with care. The first bag I received with my Unlimited subscription. Have been thinking of purchasing one of these bags for quite some time, so this was a perfect way to give it a test run! Beautifully constructed and very high quality. It's quite a large tote (with almost too much room), but I still loved using it as my work tote for a week or so. Can't wait to try the other colors. The pictures made it seem more structured but it's actually quite floppy, which unfortunately just doesn't fit my aesthetic. It's also larger than I expected and the top is wider than the bottom by more than it seems in the picture. I thought that it was a bit overwhelming on me, but I have a tiny frame, and it does manage to fit a lot! The drawback is that the straps are thin so it's not super comfortable if you're carrying around a lot. The leather is great quality and the cell phone compartment inside was big enough to hold my phone and huge set of keys. This would be a great bag for someone with a more casual style who likes unstructured bags, but it just wasn't sleek/professional enough for my style. The pebbled leather was gorg. I loved this bag. Perfect carryall and very durable. Great versatile bag got every day use. Gorgeous color. Very cute bag - high quality! It's a nice big leather bag. No real pockets so it gets a bit messy but it's nice to throw a couple of iPads in and a change of cloths. Very nice leather. The bag is humongous! and the raw leather inside rubs off on anything you place in the bag, beautiful in it's simplicity, but lacking in functionality for my needs. Lightweight and perfect for everyday use! Purse was perfect to tote around my work supplies. I LOVE this bag. The leather is soft and high-quality. Color is pretty close to the photo, a whiskey with red tones. This bag is huge, and will hold everything. Not many pockets, so you'll need to have a case for makeup. Inner pocket will hold an iPhone 6 and maybe some business cards. I used this bag for work and received a ton of compliments! Big, floppy bag. Nice for stashing everything. This bag was a bit larger than I expected but pretty nice. I love leather and that is exactly what this bag is, no lining and not a lot of stiching. I used it as my everyday carryall. Tuck the top corners in for a different/smaller shape. To me the color is more brown/carmel in real life. The picture seems a little orangy to me. I used this for several work trips and received many compliments at the airport and hotel. Only wish it had more compartments or could zip shut, but it fit everything including my wallet, sunglasses, macbook pro, and iPad. Great leather quality and smelled lovely. This bag has been great! A super cute everyday bag! The leather is lovely. It is very durable! 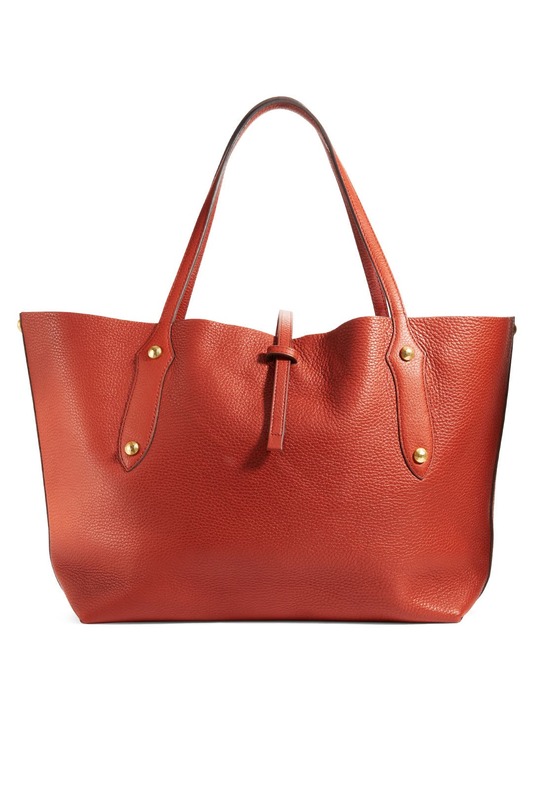 Beautiful leather tote! Only complaint: really wide bag compared to its height. This is a floppy unstructured bag which is on trend. Yet it is better used for a shopping tote rather than a purse. I absolutely fell in love with this tote! The color is gorgeous and the size is great! Doesn't look huge, but definitely is! It can hold everything I needed all day long (work laptop, gym clothes, etc). I am considering buying this tote because I loved it that much! Used for work for the gym for an overnight trip. Holds EVERYTHING! Softest leather too. Will be renting again! I got tons of compliments on this tote. It looks and feels quality and you can fit just about everything your busy life requires you to carry. Now if I can only keep it light with all the stuff I put in it! Good luck bag with some functional challenges. The rough leather on the inside got caught on my cashmere sweaters, so when I'd pull a black sweater out of my bag it'd be covered in little leather flecks. It was also so big and roomy that it was hard to find things and so open that I always worried things would spill out. Wore it to work. Has a little card pocket on the side to hold an ID card/ credit card and a small zipped compartment. 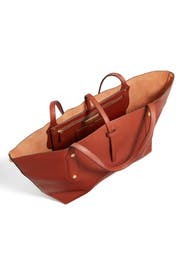 I was looking for a large tote that could be easily packed and used while traveling. This bag suited those tasks perfectly. Probably larger than I would carry for an "everyday" bag but am contemplating buying one just so I can have it when I need it. The bag is much lighter than anticipated for a leather bag of this size too, bonus! It was fun to try a large tote, but smaller bags are more comfortable on my body. It was too big for my petite size. Sadly, it came wrinkled and I don't think you can do much for leather ( can you?). So I am sending the bag back. So pretty though if it had been packed properly. leather will sometimes have wrinkles, dents, different shades, it&#39;s can be the character of the piece of leather. Great bag - fits in everything and looks expensive. Leather had a bit of nap that got orange all over other items. love the color! Great for winter! I paired it with some brown leather riding boots! Its real lather! Nice suede insde. Pretty rich color! Its a great bag with an amazing Fall color! 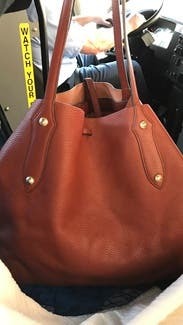 It is a lot larger than expected so it can be kind of bulky, however, it can fit everything in it while the durable leather tote is still very fashionable. I was able to wear dressed up and casually. I love large bags, this bag fit everything and i loved the color. I love love this bag, if it weren't so much I would pay to keep it. It's larger than expected but I ended up enjoying that part of it. I received this as part of an Unlimited shipment and only kept it for a weekend. I didn't love the bag, although the brown color looks even better in person and you can tell it's very high quality. I like my bags to be a bit more structured, and this one was pretty saggy and would flop all over the place if you set it down. It's extremely roomy - I had ample room to throw in a ton of things, but this also meant it was nearly impossible to find what I was looking for in the bag! This was my first bag rental from RTR so I'm pleased by the quality, but I would choose another style in the future. This bag has been wonderful! Great size and nice color. Nice everyday bag. I would love to keep in longer, but will return since the unlimited membership is doubling. Gorgeous leather, perfect relaxed bag for work and fun. So soft and cute! Great for work or weekend! The leather smelled amazing! The leather is super soft and it is a bag that can fit a whole laptop but doesn't look too big when you're just carrying it around town. I loved using this bag for work and a long weekend trip! Was super cute, looked a lot like the one I have for madewell. I lover this bag. It's easy to loose stuff in and becomes heavy - holds a lot! Loved it so I bought it! This bag is a pack mule. I currently have a pair of shoes, a planner, a wristlet, a scarf, a bottle of pellegrino, makeup, odds and ends... and I could fit more without it getting misshapen. It's literally a magic marry popping bag. With that said, you do loose things in it. There is one small pocket which can fit a phone, or credit card, and that is it. This bag can fit on the shoulder but it does slide, so it's more of a crook of your elbow sort of bag. Additionally, the only way to "close" the bag is by pulling a strap through a loop which is not a very secure way to close a purse. All in all the bag is made well, the studs are very pretty but subtle. This has turned into my everyday purse and thankfully it's almost spring and this purse is purrfect!! !